The French politician broke the news on his official Twitter account today. FORMER FRENCH LEADER Nicolas Sarkozy has announced that he will seek the nomination of his centre-right party to stand in next year’s presidential election. “I have decided to be a candidate in the 2017 presidential election,” Sarkozy, who was president between 2007 and 2012, wrote in the foreword to a new book Tout Pour La France (All for France) due out later this week. “The next five years will be filled with danger but also with hope,” wrote the 61-year-old conservative, who had made no secret of his ambition to reconquer the top office. France demands that you give her your all. “I feel I have the strength to lead the fight at such a turbulent moment in our history,” Sarkozy said, alluding to the string of terror attacks that have rocked the country in the past year and a half. His aides told AFP that he would be stepping down today as the leader of the Republicans party to focus on his campaign. “This book is the starting point,” Sarkozy tweeted, together with a link to the extract from his book. Sarkozy listed five major challenges for France in the years ahead, including defending national identity, restoring lost competitiveness and enforcing state authority. His announcement that he will seek his party’s nomination at a primary in November comes in the midst of a resurgent debate over the place of Islam in French society, encapsulated in the row over the Islamic burkini swimsuit. Sarkozy said France’s “principal battle” was over how “to defend our lifestyle without being tempted to cut ourselves off from the rest of the world”. The opposition leader, who has repeatedly dismissed Socialist President Francois Hollande as weak, said he would also restore authority in neighbourhoods where he said “minorities are successfully blackmailing the existing the current authorities”. The pugnacious politician, who was defeated in his bid for reelection in 2012 after conducting a campaign heavily focused on immigration, faces several challengers for the conservative nomination. His chief rival, former prime minister Alain Juppe who is seen as a moderate, is the favourite to win the Republicans’ nod but has seen his lead over Sarkozy in opinion polls shrink in recent weeks. If Sarkozy wins, he could face a rematch against Hollande, who has said he too has the “desire” for a second term. He would also face far-right National Front leader Marine Le Pen, whom opinion polls show among the top two presidential candidates. Email “Nicolas Sarkozy declares candidacy for French presidential election”. 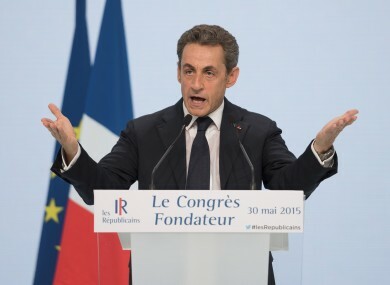 Feedback on “Nicolas Sarkozy declares candidacy for French presidential election”.